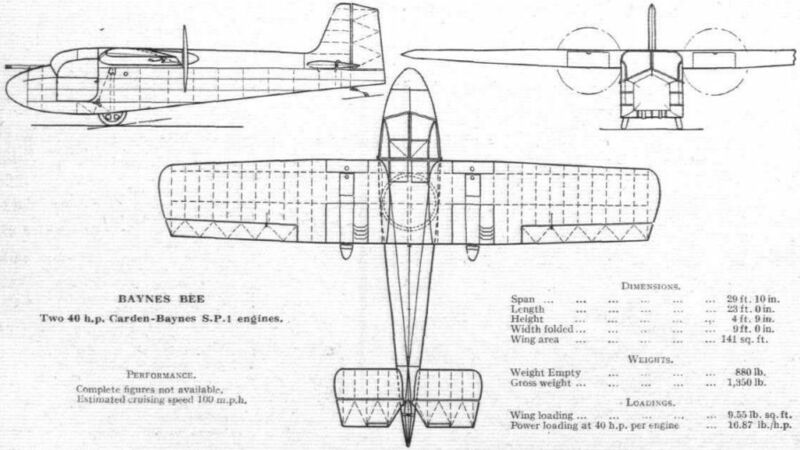 The Heinkel He.51 "... reminded one of the old 1917 Albatros D.V. 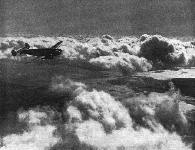 of the war, cleaned up, modernised, infinitely more powerful and faster." The civilian markings of German military aircraft are in some cases being discontinued. 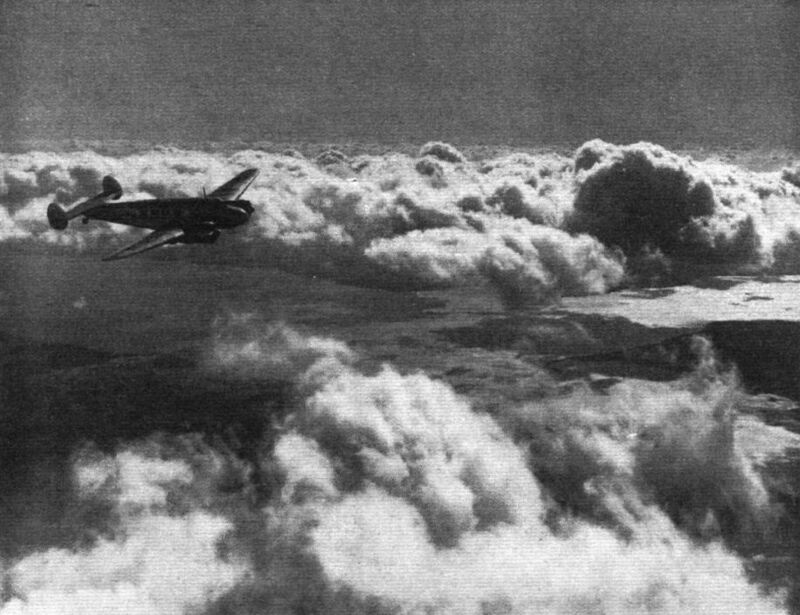 Striking impression, from the German official publication Die Deutsche Luftwaffe of Heinkel He.51s. in formation. 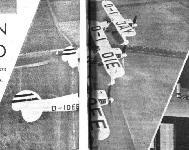 This is the type with which the Richthofen Squadron is equipped. 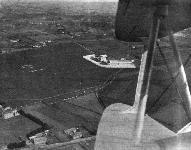 A Staffel of the Second Group, Richthofen Squadron, Taking-off from Damm Aerodrome. The view shows the open nature of the country. 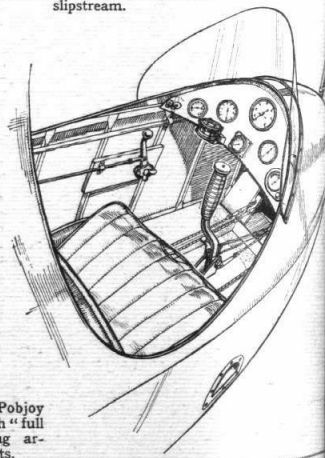 In this view of one of the Richthofen Squadron's Heinkel, the bomb-like auxiliary fuel tank between the undercarriage legs is just discernible. 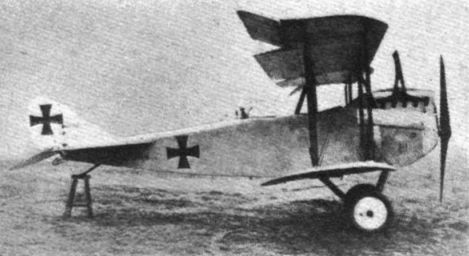 The successful Albatros D 5 fighter with 175 h.p. Mercedes. Note the modernity of line. 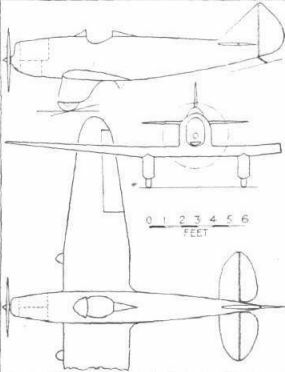 The fine lines ot the Beechcraft M.18 are brought out in the flying view. 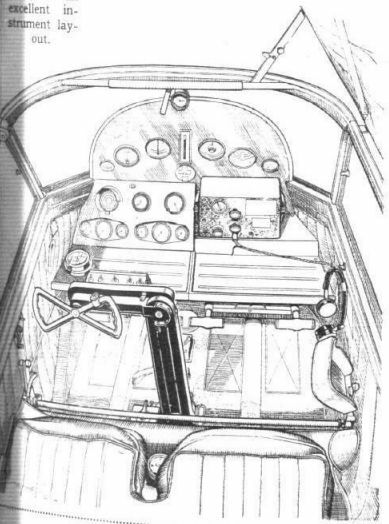 Note, on the instrument panel, the central space for Lear radio. M.2X Hawk Trainer являлся самолетом первоначального обучения, после его освоения курсанты переходили на Miles M. 14 Magister. Hawk Trainer в больших количествах использовали британские ВВС. 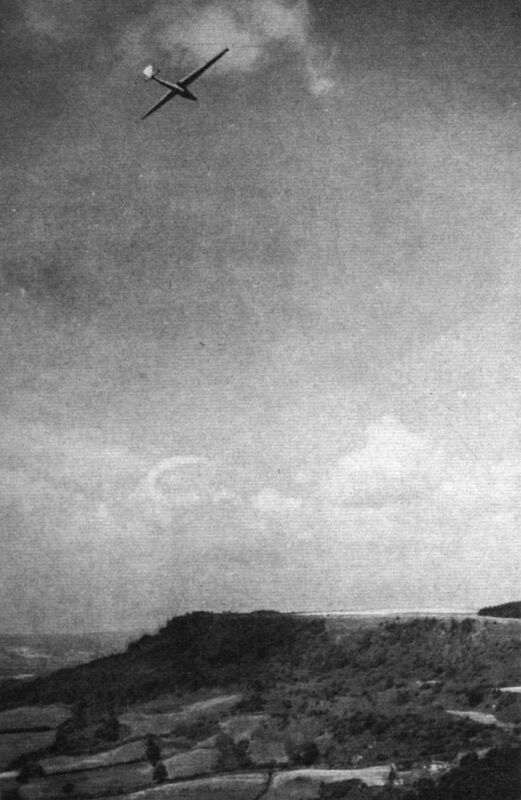 Самолет на фотографии был построен в 1936 году, а в 1940 году эти машины начали снимать с эксплуатации. 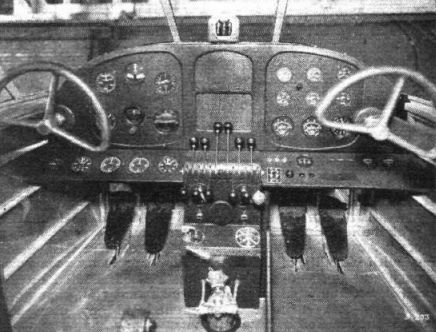 For modern instruction: The Miles Hawk Trainer, a machine which is designed primarily for the training of Service pilots in modern technique. MAGISTER ARTIUM: Mr. F. G. Miles, past-master of the art of aircraft demonstration, reveals the qualities of the Miles Magister trainer (D.H. Gipsy Major) at a "family gathering" of Phillips and Powis employees last week when the prototype was christened with due ceremony by Mrs. Miles. The Magister is basically similar to the Hawk Trainer, but has been revised in detail. 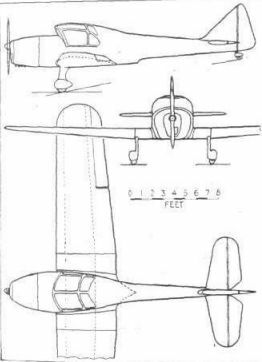 Note, for example, the new undercarriage and the tail wheel. 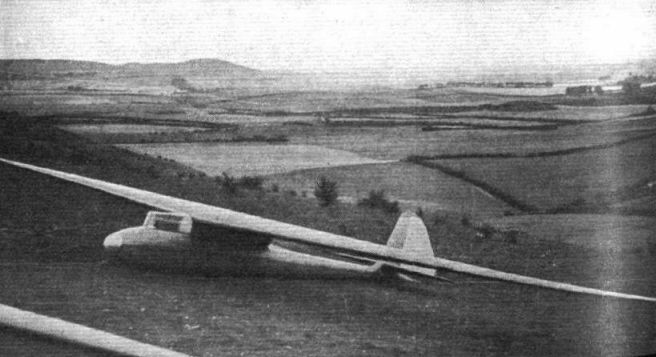 A typical Gotha bomber with a pair of 260 h.p. Mercedes engines operating as pushers. 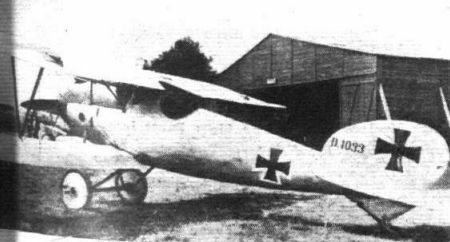 A two-bay single-seater fighter - the Halberstadt Type D with 120 h.p. Argus engine. 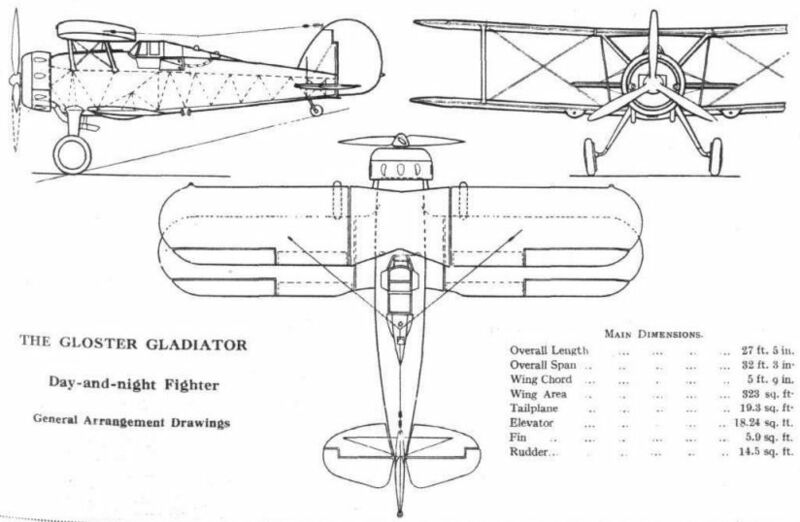 A plan view of the Gladiator is shown in this steeply banked turn above the clouds. 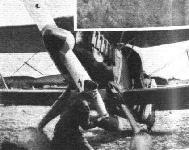 Manoeuvrability is one of the attributes of the compact biplane and is combined with speed in this particular day-and-night fighter. NATIONAL SHOW: Contrasts in fighters at the National Aviation Show recently held in New York. 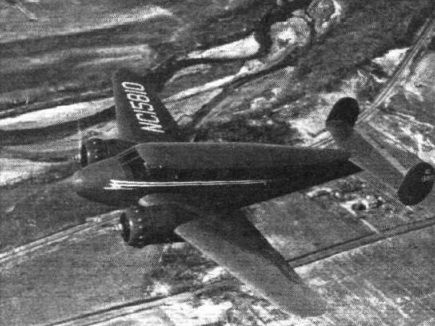 The Seversky pursuit (1,000 h.p. 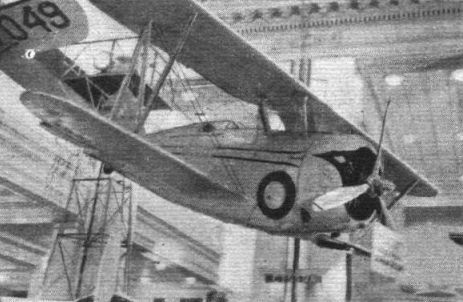 Pratt and Whitney Twin Wasp) ordered in quantity by the U.S. Army Air Corps. THE WEARING OF THE GREEN: An Avro Anson (two 310/355 h.p. 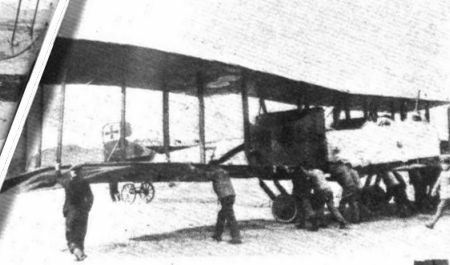 moderately supercharged Siddeley Cheetah IXs) on test at Woodford prior to delivery to the Irish Free State Air Force, which is composed almost entirely of Avro aircraft. All its machines, including some Vickers Vespas, have Siddeley engines. LEG SHOW: Members of the R.A.F. 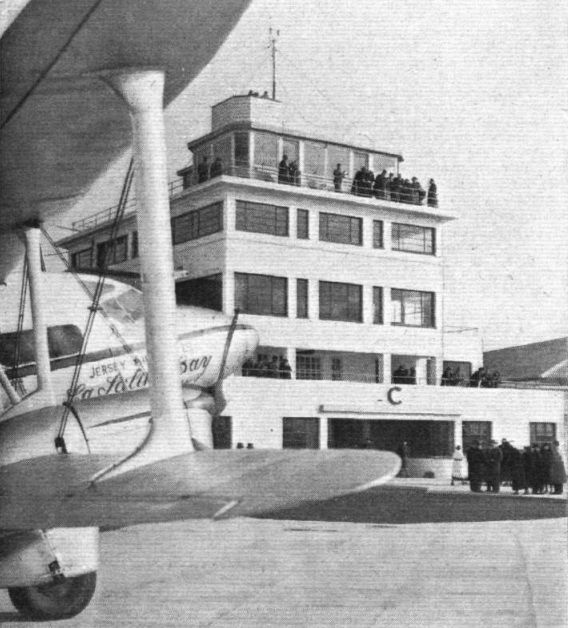 Staff College, Andover, in the undercarriage-erection department of Handley Page's Cricklewood works, where they inspected the methods used for the rapid production of large numbers of Harrow heavy bombers. 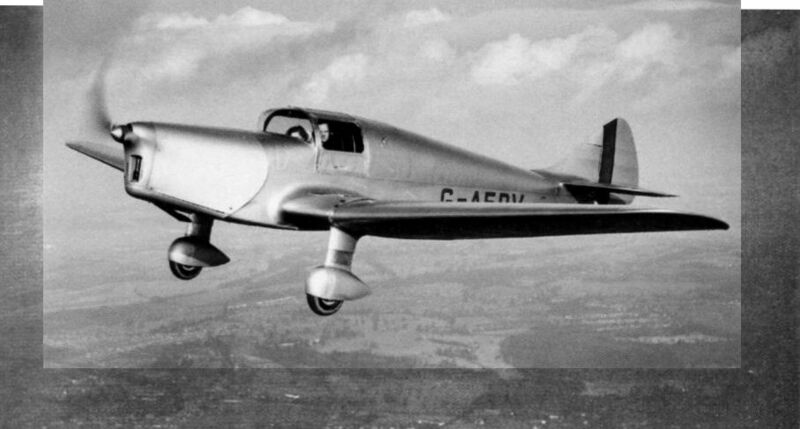 The latest Tipsy monoplane, which is powered with a dual-ignition Sprite engine and has a range of 470 miles at a cruising speed of 80 m.p.h. or more. 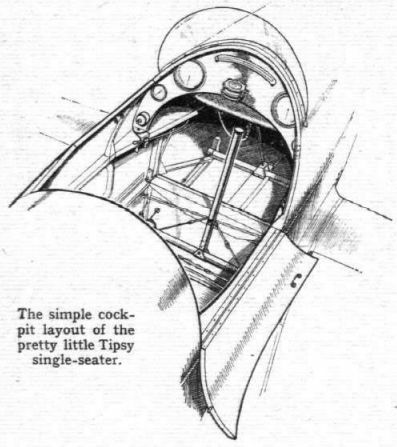 The simple cockpit layout of the pretty little Tipsy single-seater. 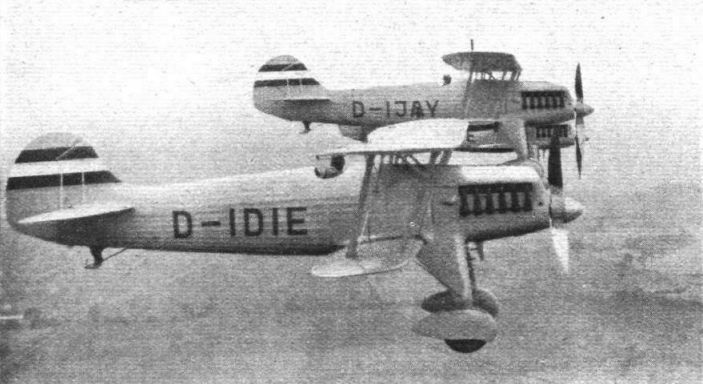 The D.H. "Hornet Moth" Seaplane (130 h.p. D.H. "Gipsy-Major" engine). 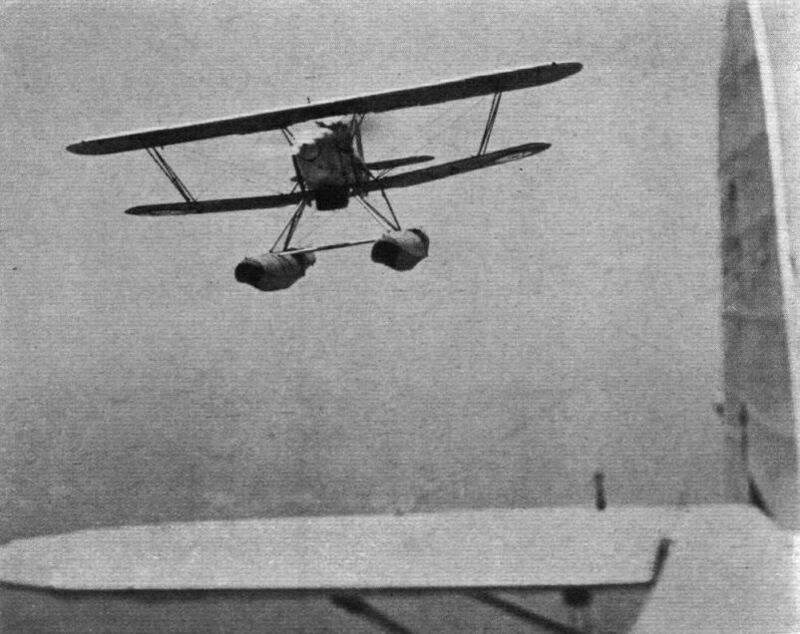 As might be expected, the Hornet Moth has an excellent performance as a seaplane. With two occupants and more than 100 lb. of luggage, the machine has a range of 316 miles while cruising at 95 m.p.h. Tests on a Canadian lake, lying some 1,500 ft. above sea level, showed that the Hornet was off a glassy surf ace after a 30-second run. For luxury ownership: The D.H. Dragonfly, aptly described as "an air liner in miniature," cruises at 127 m.p.h. for 885 miles with five occupants and their luggage. The latest Monospar De Luxe, which, in standard form, is fully equipped for day, night and blind flying with four occupants and their luggage. The DeLuxe Monospar has a spectacle-type swing-over control column, and an excellent instrument layout. The latest Phoenix, which carries five people on 200 h.p. and has one of the quietest cabins of any single-engined machine. Easy ingress and egress and an excellent view for the passengers are features of the Heston Phoenix. Another lightweight single-seater - the Luton Minor. 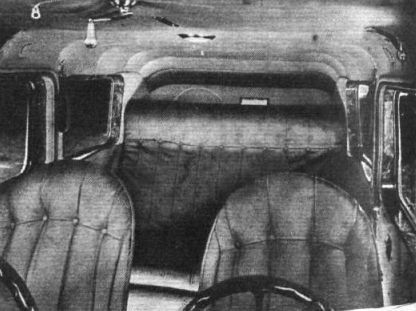 There is a genuine saloon car effect about the interior of the Percival Vega Gull. 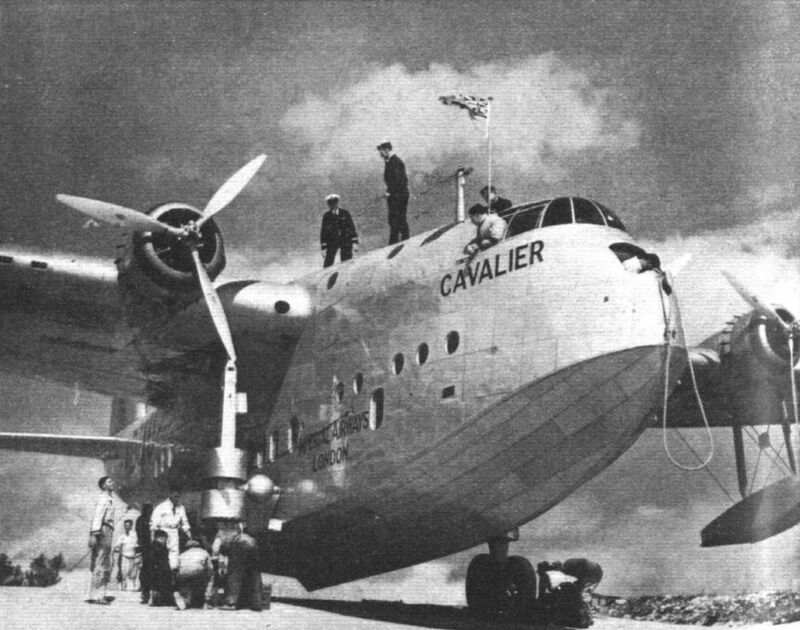 SUNSHINE SOMEWHERE: A heart-warming picture, in these chilly British March days, ot the Short Empire Boat Cavalier at the Bermuda Air Base for her experimental Bermuda to New York flights. Leaning from the cockpit is Capt. 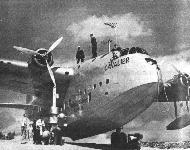 Armstrong, the commander, and in uniform is First Officer Richardson (second pilot); in mufti on top of the machine is Mr Bell. Short Bros., and Mr. Hayuen, of the A.I.D., is behind the flag mast. SPLICING THE MAINBRACE: One of the new Shell refuelling tenders ministering to the Empire boat Cambria during a demonstration at Southampton last week These tenders carry 2,500 gallons of spirit and 200 of oil, and deliver the former at 120 gall./min. Twenty-one are under construction, by Dunstans, of Doncaster, Rowhedge Ironworks, of Colchester, and Thornycrofts. Others are being built for use along the routes. By dint of clean design, the Hillson Praga has an excellent performance for a machine with a 40 h.p. engine. Production is now in full swing. 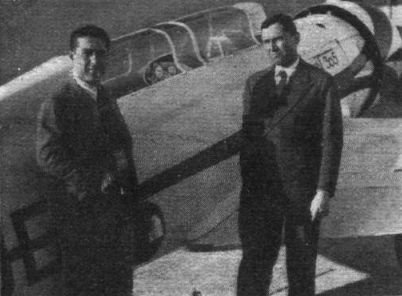 Signor Zapetta (on right) with his companion and the Italian F.N. 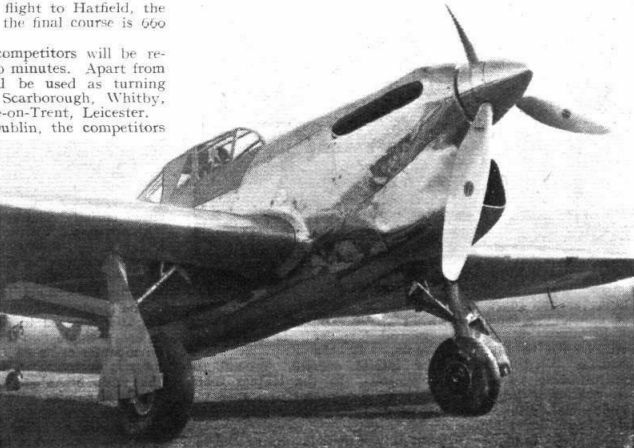 305 monoplane which won the Speed Contest at 185 m.p.h. 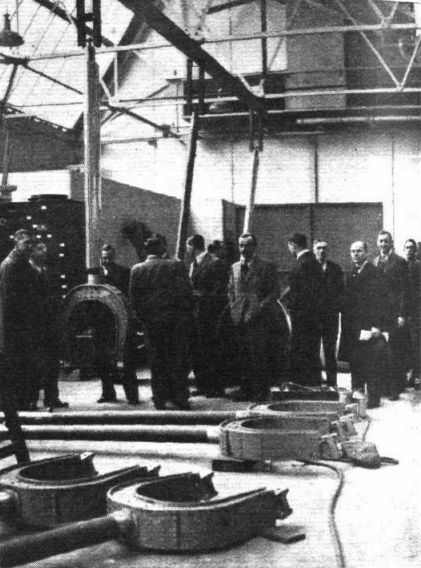 AS IT WAS: The Dutch "safety-first" machine which was crashed while being demonstrated last week at Gravesend, preparatory to its serious introduction into this country. 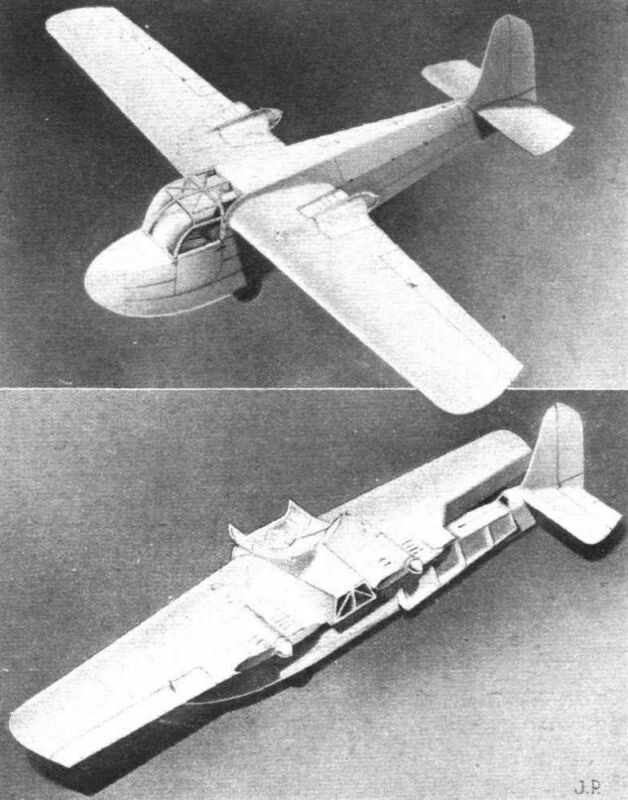 The Scheldemusch (Scheldt Sparrow), as it is called, is a single-seater cabin pusher which, with a 40 h.p. Praga B engine, has a maximum of 78 m.p.h. It has a steerable nose wheel and the undercarriage is arranged so that the tail cannot be depressed until full flying speed is reached. Either a "flown-in" or normal landing can be made, and slots, with differential ailerons, look after stalled safety in the air. 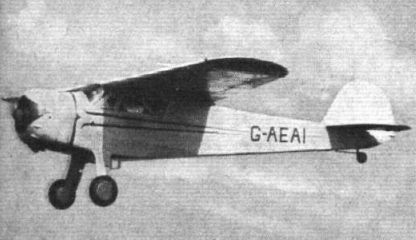 The American private-owner type: The Cessna. SPRING - AT 9,000 ft: A sunny impression, by Flight's photographer, of the first of British Airways' new Lockheed Electras flying above the clouds near Southampton, where the machines are being erected. Mr. Marshall Headle, Lockheed's chief test pilot, is in charge. 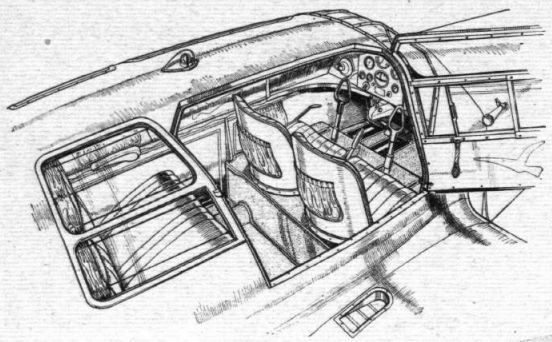 "Saloon car" interior appearance is the aim in the latest Stinson, another American type with British concessionaire. 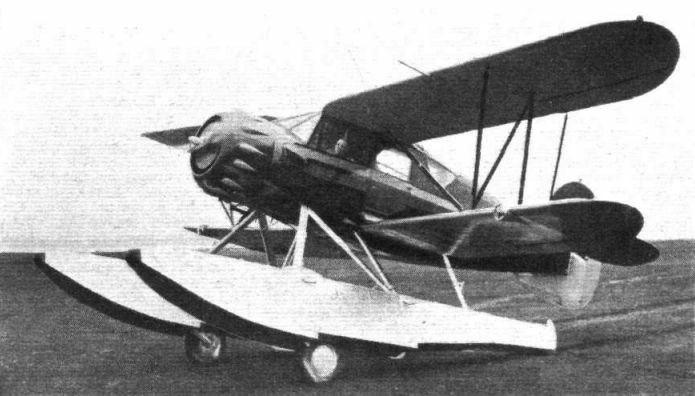 PRIVATE AMPHIBIAN: After one has learnt to hold off, while landing, at about twice the height of a normal undercarriage, this Edo amphibian gear - shown fitted to a Waco - should have definite advantages. The tail of each float is hinged and sprung to take tail-down landing stresses and the whole gear weighs 175 lb more than the standard float arrangement. M.11 выпускался в вариантах M.11A, M.11B и M.11C. 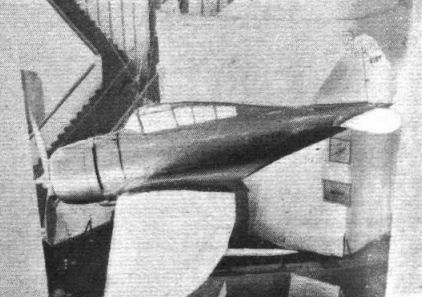 На фотографии - M.11A. 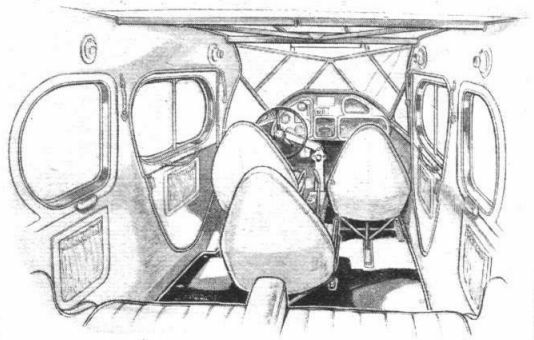 One of the most interesting private owner's types to be introduced during the past year - the Miles Whitney Straight, comfortable two-seat cabin monoplane on familiar Miles lines. A Villiers-Hay Maya I installed in the Miles Whitney Straight. The miniature fire-tube boiler is the oil tank. Spacious side-by-side seating in the Miles Whitney Straight. 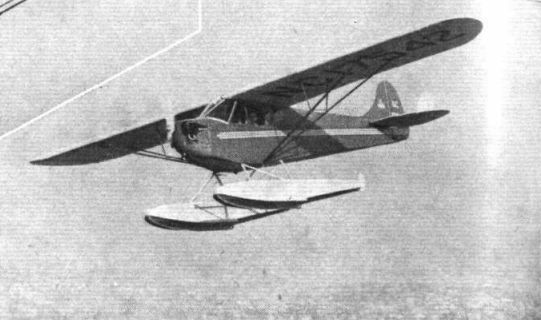 The American private-owner type: The Taylor Cub as a floatplane. FISH HAWK. 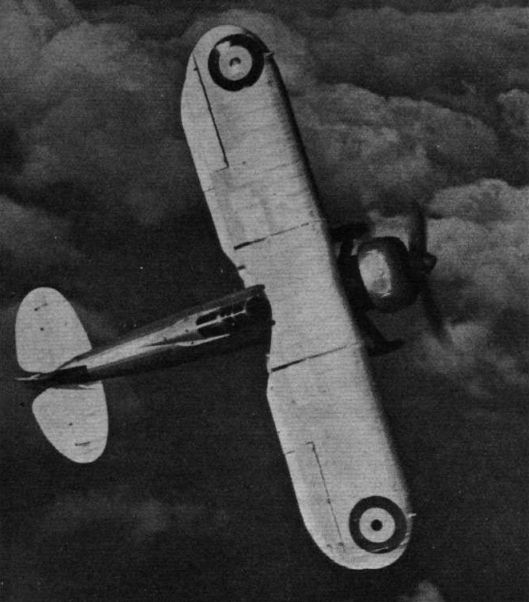 A Hawker Osprey IV fleet fighter reconnaissance floatplane of the Mediterranean Cruiser Squadron in company with another of its species. The machine is the most recent version of the Osprey to go into service and is fitted with the supercharged 600/640 h.p. Rolls Royce Kestrel V engine. VIRGIN COUNTRY: A Fox Moth operated by Air Travel, N.Z., Ltd., flying down the Westland coast. In the background are Mt Cook and Mt. Tasman, the highest mountains in New Zealand. Sqdn.-Ldr. T. D. Hewett is the pilot. 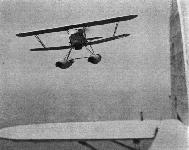 Designed to be flown by the novice pilot: the Dart Kitten, at present fitted with a 7 h.p. Ava flat-four two-stroke engine. The Drone pilot has an excellent view and is free of airscrew slipstream. 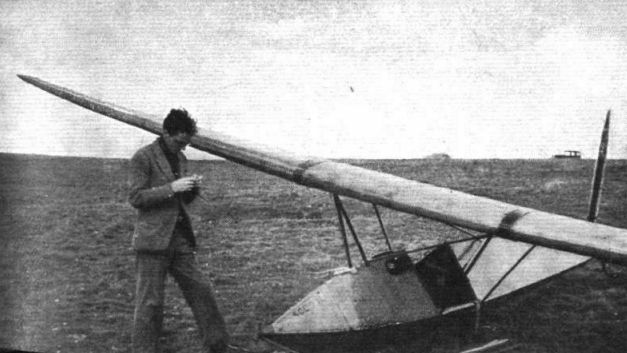 Mr. Philip Wills, holder of the British distance record, and the Abbott-Baynes Scud II, holder of the British height record (piloted by Fit. Lt. Buxton). Scud II is not a high-performance machine, but for height records this is not so important as strong construction and a very high degree of skill in the pilot. 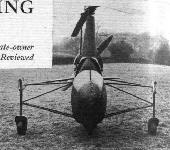 A Rhonadler at Dunstable: In spite of the absence of fixed tail-plane, the very small fixed fin and the highly tapered wing, this machine is remarkably stable. It is easy to fly safely but very difficult to fly well enough to achieve the performance of which it is capable. It is difficult to imagine anything "cleaner" than the Rhonadler. It is so clean, in fact, that a highly varnished finish is well worth while - and for competition flying it is wax-polished all over. Launching Hjordis I: Although the span is 50 ft., the chord is very narrow, and the wing loading is unusually high for sailplanes. 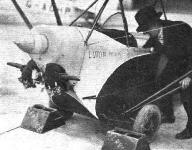 On this machine Mr. Wills broke the British distance record by flying from Dunstable to Lowestoft, 105 miles. Hjordis I over Sutton Bank. 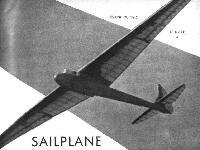 The first really high-performance sailplane designed and built in England (by Slingsby Sailplanes of Kirby Moorside). Stability has been to some extent sacrificed to performance. Controls are very effective, but have no "feel," and Hjordis gathers speed very rapidly indeed if the nose is allowed to fall by 2 or 3 degrees. 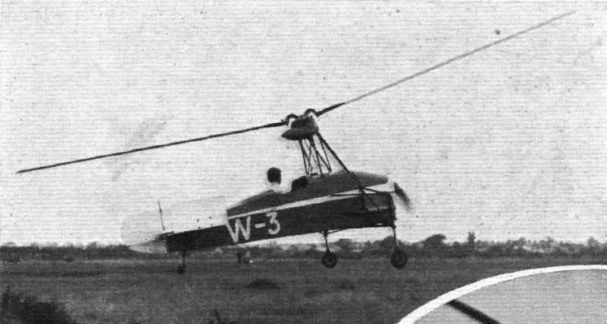 The Weir Jump-start autogiro leaps straight off the the ground. 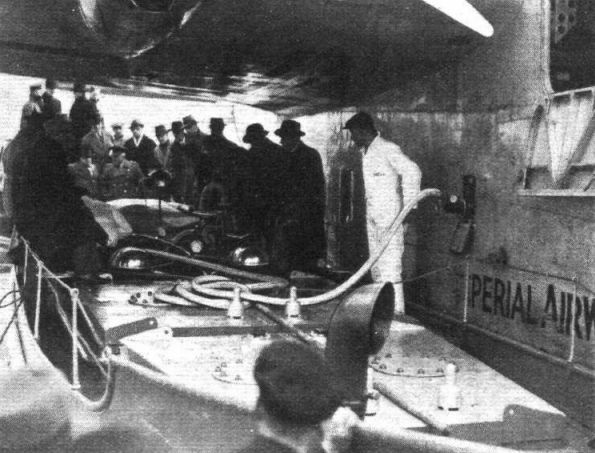 It is fitted with a Weir engine of 45 h.p. 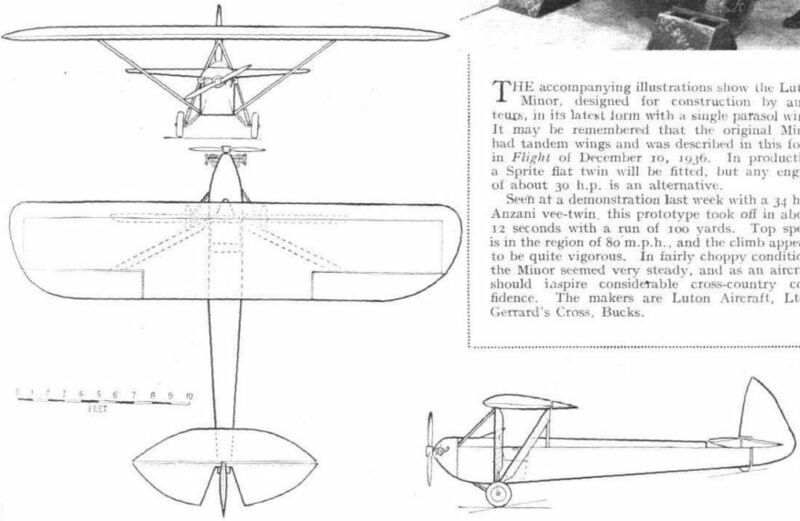 These two sketches illustrate the ingenious "turntable" wing-folding system of the Carden-Baynes Bee. 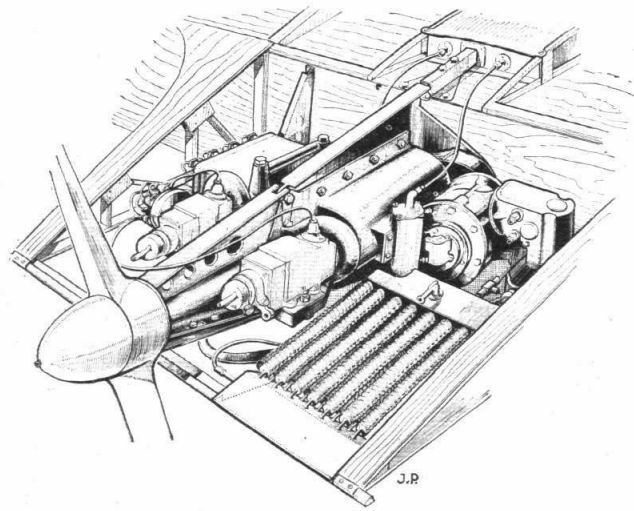 The main features of the Carden-Baynes S.P.1 engines and of their installation in the wing of the Bee are revealed in this sketch. 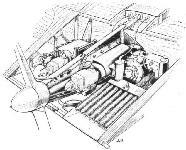 The airscrew extension shafts are integral with the engines. 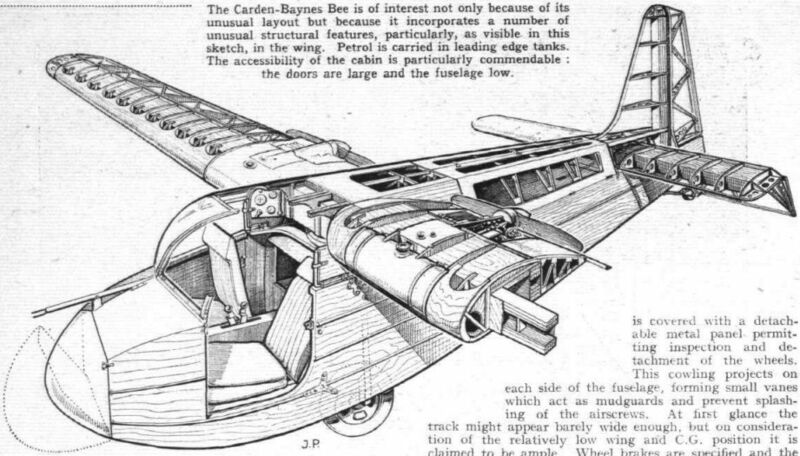 The Carden-Baynes Bee is of interest not only because of its unusual layout but because it incorporates a number of unusual structural features, particularly, as visible in this sketch, in the wing. Petrol is carried in leading edge tanks. 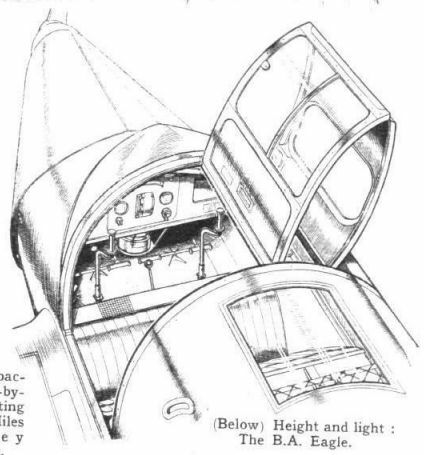 The accessibility of the cabin is particularly commendable: the doors are large and the fuselage low. 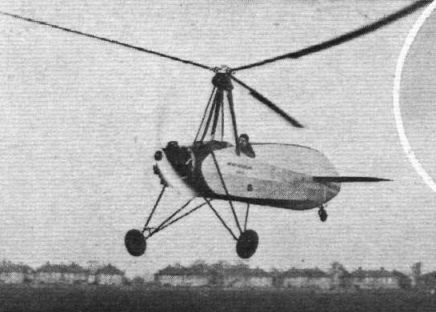 The new Nagler Helicogyro can be flown either as a helicopter or as a machine with windmilling rotor. Stressed-skin in miniature: the CW. Cygnet Minor, which should shortly be flying.